Completion of the part-time, intensive 15-month UCLA-NUS Global Executive MBA for Asia Pacific program leads to two MBA degrees, one awarded by UCLA Anderson School of Management and one by NUS Business School. Each degree requires satisfactory completion of all necessary degree requirements of both institutions. Students will complete a total of 72 credits—36 credits from UCLA and 36 credits from NUS. The six two-week modules held in four different countries over 15 months are designed to accommodate the demanding schedules of senior working professionals. The concentrated class schedule minimizes travel and disruption and allows students to maintain their jobs, no matter where their job takes them. The calendar for the UCLA-NUS Global Executive MBA for Asia Pacific program consists of six intensive two-week segments. Classes are conducted in residence at NUS in Singapore and UCLA in Los Angeles, as well as in Shanghai, New Delhi, and Bangalore. Each segment consists of three course modules. The program culminates with a two-part Management Practicum. In lieu of a master’s thesis, the Management Practicum is a global strategic consulting project designed to employ and enhance concepts learned in the classroom and apply them to a real-world business situation. The typical UCLA-NUS Global Executive MBA for Asia Pacific class is 29 percent female and 71 percent male. About 59 percent of matriculated students were born in Asia, while 33 percent identify as being from the Americas. Four percent cite Europe as their home continent, and 2 percent hailed from the Middle East. On average, students have 15.6 years of professional experience when they begin the program. The average age of students enrolled in the MBA programs is 39.6. Students have access to career advisors and executives-in-residence who will help with industry and job function overview, career assessment and development, targeting outreach and informational interviews, using the alumni network and other UCLA Anderson resources, resume and cover letter review, mock interviews, job offer evaluation and negotiations. Throughout the year, workshops and panels occur that feature Parker CMC advisors, second-year students, alumni and executives. Anderson also provides extensive web-based career resources for students. Hundreds of companies seek out Anderson MBA graduates by visiting campus, posting jobs and searching through resumes. Anderson helps students expand their network and grow relationships with these companies, as well as with companies that may not have a large presence on campus. Before graduating, nearly 83 percent of UCLA/Anderson students receive a job offer and that number increases to over 91 percent three months after graduation. After completion of the program, graduates see a 78 percent average salary increase. The tuition fee for the UCLA-NUS Global Executive MBA for Asia Pacific is $118,080 USD (exclusive of Singapore Goods & Services Tax). Fees are paid in three installments prior to every alternate session. This tuition fee includes the cost of recommended textbooks and readings, as well as most meals for each residential segment. The cost of travel, accommodation and miscellaneous expenses are not included and are to be borne by the participant. 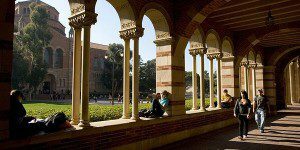 Though UCLA-NUS Executive MBA Program students are ineligible for most loan and scholarship programs, they may be able to obtain scholarship through their companies. Alternatively, students can look into loan options through banks in Singapore and the U.S. International students (from neither Singapore nor the U.S.) may be eligible for funding through Prodigy Finance. Applicants to the UCLA-NUS Global Executive MBA for Asia Pacific program must have significant full-time work experience (a minimum of ten years) and a current position with high-level managerial responsibility. Applicants must have completed a Bachelor’s degree from a regionally accredited college or university and possess full-time, professional work experience not including internship experience for admission. To apply to Anderson’s UCLA-NUS Global Executive MBA program, applicants must submit a completed application form, college transcripts from degree-granting and non-degree-granting institutions, a current résumé, and two letters of recommendation. The school also requires applicants to complete a personal statement and to send a nonrefundable $200 application fee.